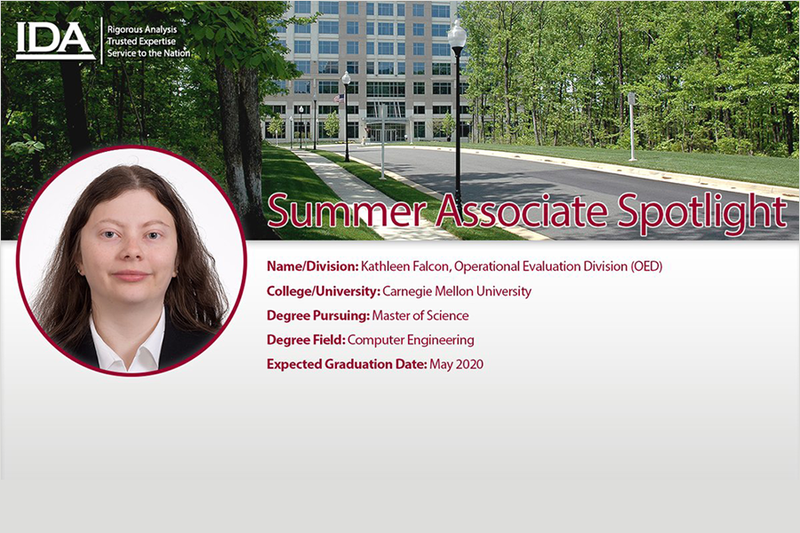 Carnegie Mellon University student, Kathleen Falcon joined the Institute for Defense Analyses (IDA) as a Summer Associate in IDA’s Operational Evaluation Division (OED). Kathleen is a graduate student at Carnegie Mellon University working towards her master’s degree in Electrical and Computer Engineering. In 2018, she received her bachelor’s degrees in Computer Science and Psychology from Fairleigh Dickinson University. IDA is a not-for-profit corporation that operates three Federally Funded Research and Development Centers (FFRDCs) in the public interest. IDA provides objective analyses of national security issues and related national challenges, particularly those requiring extraordinary scientific and technical expertise.